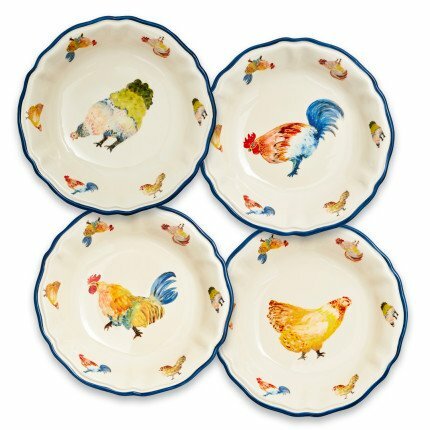 Sur La Table Jacques Pepin Collection Chickens Pasta Bowls, Set of 4 by Sur La Table at Foom App. MPN: 2017/22. Hurry! Limited time offer. Offer valid only while supplies last. Perfect for serving everything from penne Bolognese to spaghetti carbonara, our pasta bowls add a touch of rustic French charm to any tabletop. Perfect for serving everything from penne Bolognese to spaghetti carbonara, our pasta bowls add a touch of rustic French charm to any tabletop. Blue-rimmed, white earthenware plates are embellished with Jacques' chickens and roosters in four unique styles. Set of four plates coordinates beautifully with our Jacques Pepin pasta serving bowl (sold separately). The best cooking is a happy marriage between technique and creativity, and who better to demonstrate this than Jacques Pepin? An artist both in the kitchen and in the studio, Jacques worked with us to create this exclusive collection in celebration of his truly remarkable career. Inspired by his whimsical artwork, each piece is designed to bring a bit of the art and soul of cooking to your own table. Bon appetit!